Thou strovest valiantly in thy sacred contest; and even after death, thou makest us holy with streams of healings, O all-famed Euphemia. For this cause we venerate thy most holy dormition and with faith we stand before thine all-ven'rable relics, that we be freed from illness of the soul and also draw forth the grace of thy miracles. 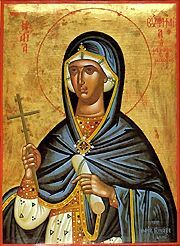 Share the feast of Euphemia the Great Martyr with an icon greeting ecard.